Previously I have discussed the origins of Hot-pot and stressed the point that most early sources that mention the dish come from quite high status sources, rather then pointing to a more humble origin as is commonly assumed. Moreover, I also stressed that there was a wider variety of ingredients in these early recipes then is also commonly allowed in an authentic Hot-pot. However, it is not possible to avoid the fact that most people associate this dish not with men's clubs and upper-middle class dinner parties, but with simple family meals. If asked to suggest a likely origin of the dish, most people will mention mills or mining, in other words Hot-pot is perceived as originating with the very poor. So how did the image of Hot-pot become so firmly associated as a dish for the very poor? Part of the answer to this is that it was made a dish of the poor. By the 1870's (some 30 years or so after the first mention of the dish), charities begun distributing this dish at Christmas to the poor in Liverpool. Specifically the "deserving poor". As William Simpson, the originator of Christmas Hot-pot fund was a teetotal and a crusader for purity, one assumes that the deserving poor where those of the poor that didn't drink alcohol. 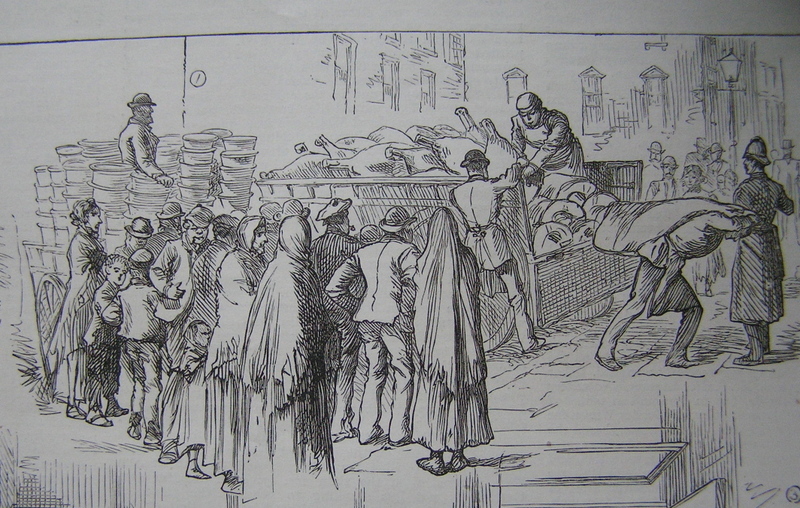 Simpson originally distributed 100 Hot-pots in 1876, after his death in 1883 David Radcliffe, the Mayor of Liverpool gained popularity and media attention by distributing 1000 Hot-pots to the poor of Liverpool in 1885. 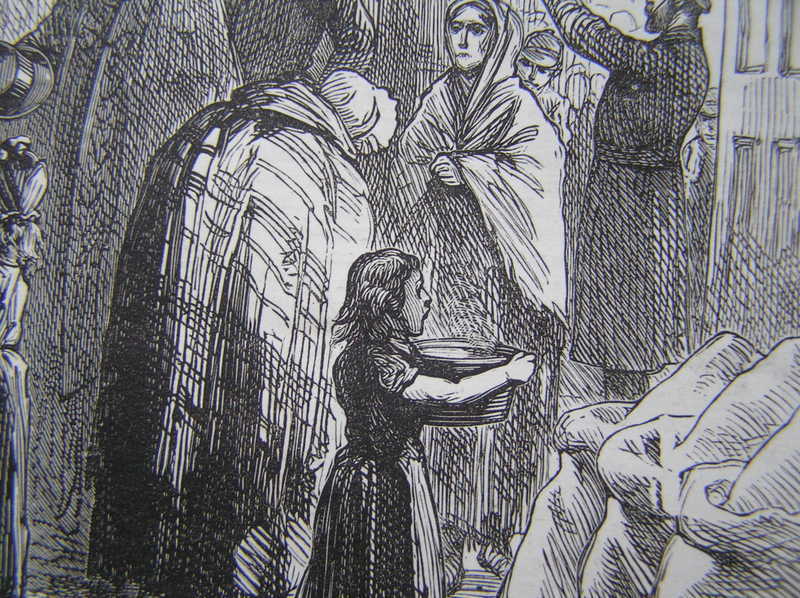 In fact, Radcliffe was only one of several charities that distributed Hot-pots to the Liverpool poor at Christmas. 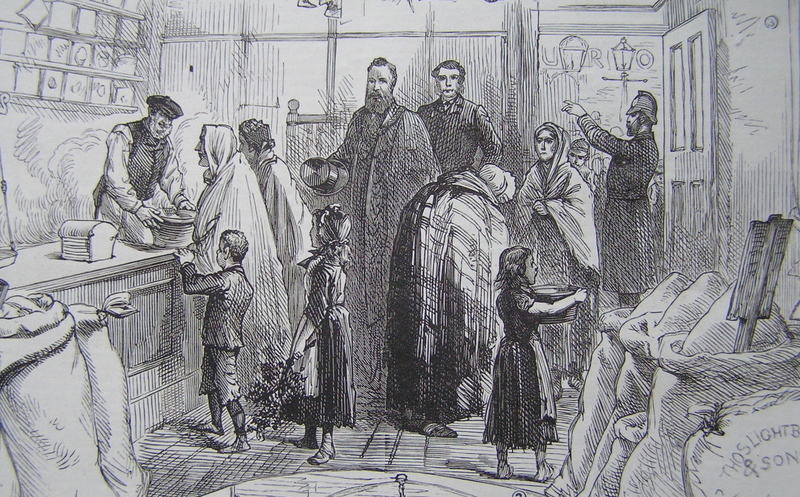 The annual distribution of Christmas Hot-pots in Liverpool was widely reported, which means that not only is that a great deal of commentary, there are also some period illustrations of the even (see below). Essentially the construction of the Hot-pots were contracted out to various cooks, they were then cooked in ovens at the Liverpool Townhall or at local bakeries. The distribution to the "deserving poor" was undertaken by representative ministers of all religious denomination (I assume this means Christian). In terms of composition, each Hot-pot contained 3 lb of meat and 5-7 lb of potatoes. Interestingly enough the meat is described as "excellent beef or mutton", which will come as a blow to those that insist that an authentic Lancashire Hot-pot is made with mutton only. No mention is made of the exact cut of meat, but the illustration indicates that the whole animal was used, which makes sense really as it would be rather a waste of resources to cut the best end of mutton chops out of enough animals to make 1000 Hot-pots! This annual even seems to have continued throughout the 19th century and potentially into the 20th century. In fact is is quite common even now in the locality for fund raising or charitable events to involve a "Hot-pot Supper". So entering the 20th century this dish has two main forms, a middle-class dinner dish which often contained oysters, kidneys as well as mutton and potatoes, and a dish made as an especially annual treat for the poor which contained mutton/beef and potatoes. It would seem obvious to me that there is likely to be substantial cross over between the two, however much people would desire there to be one authentic and true recipe. Note: These images from the "Illustrated London News" (1885), contain what I think is the earliest image of a Hot-pot vessel. These look very much like bread panchions or pankins. More on this later. Above: Unloading the supplies. Note that this looks to be beef, given the scale of the joints. Above: Distribution of the prepared Hot-pots. The bearded chap looking out of the illustration is the Mayor, David Radcliffe. Above: A detail of a crone and a waif with their Hot-pot. The poor waif is so deserving it seems that 10 lbs of Hot-pot and more is no burden at all. 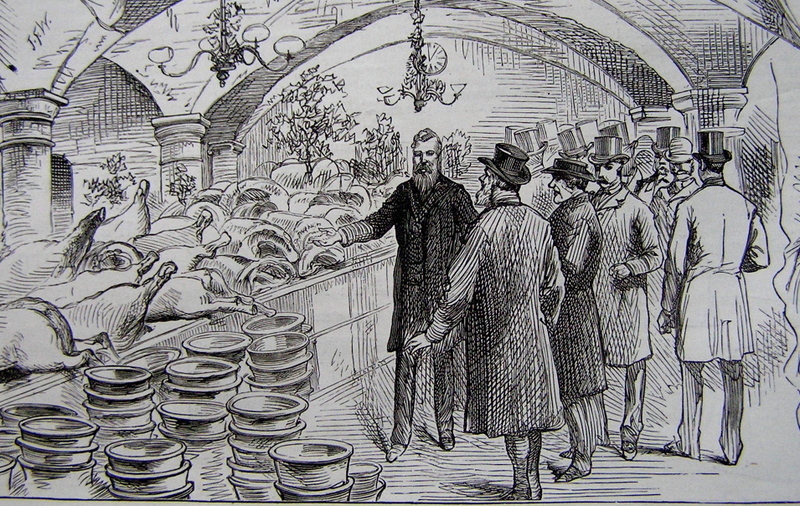 Above: David Radcliffe showing the supplies to the great and good.